Pilgrim Pines is celebrating our 60th anniversary this year and we are hoping you can help us celebrate. We have several events in the planning stages for this year and we are excited for what 2018 will bring. In March we will be holding our second annual Spring Fling, a night to bring the Pines family together for dinner, presentations, raffle/auction and a great celebration. It is sure to be a fun night, and everyone is invited. This year we are also introducing a Family and Friends Sponsor book, and it would be great to have as many families and churches represented in the book as we can. For $25 your family or church would receive a quarter page spot to write a short message. 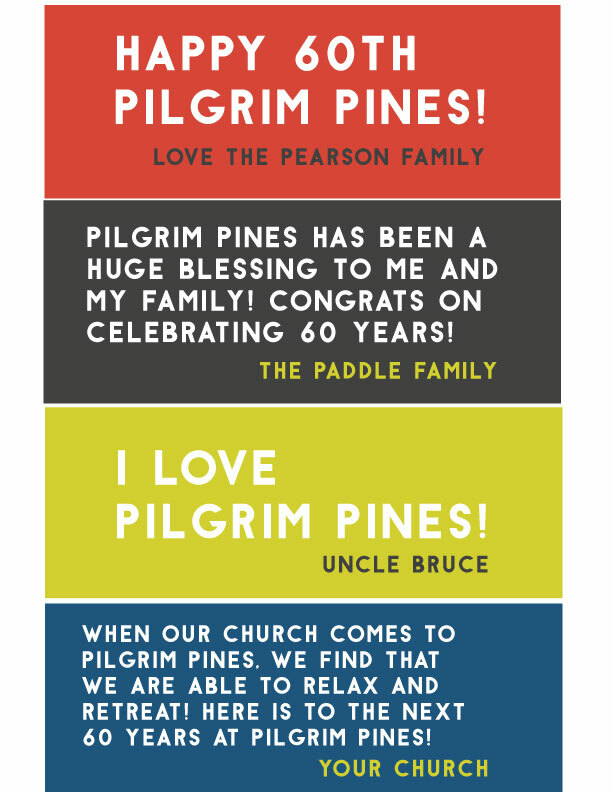 Support Pilgrim Pines with a personal message! $25 per message. Submit your short message and we'll send you an online invoice. Thank you for supporting Pilgrim Pines! We will send you an online link to make your payment. If you have any questions, please email Kayla at kayla@pilgrimpines.org.